VMware recently announced that the release of VMware View 4 is slated for later this month which will include a new display protocol called PC-over-IP (PCoIP), which should greatly enhance the user experience. 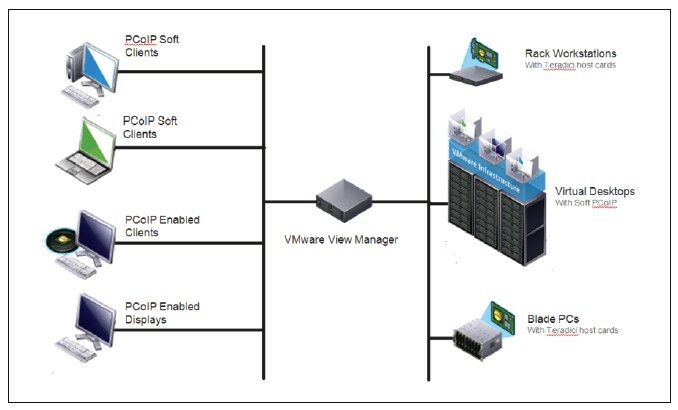 PCoIP is a relatively new technology developed by a company called Teradici that VMware has chosen to partner with to use this technology in VMware View. Teradici has developed a breakthrough innovation in display compression and propagation over LAN and WAN networks that uses hardware chips on both the host and remote to offload the compression overhead. PCoIP is a type of display protocol used by remote desktops when doing desktop virtualization, other display protocols including Remote Desktop Protocol, currently used in VMware View and Microsoft Remote Desktop and ICA which is used by Citrix. A display protocol is what delivers the desktop from the host server to the remote user along with capturing mice and keyboard inputs. The current RDP protocol that is used by VMware View has some limitations when using high-resolution desktops and complex graphic situations; VMware has chosen to use PCoIP to improve this. While PCoIP is a new protocol used in VMware View 4 the RDP protocol is still available as an alternative protocol. While similar to VoIP, PCoIP also delivers HD audio, USB and the user display as well. PCoIP will enable VMware View to deliver the true PC experience that end-users are looking for, which includes high-resolution graphics and rich multimedia, as well as streaming movies and high-definition audio capabilities. For most applications of PCoIP technology the user cannot tell that their PC is not at their desk anymore. PCoIP implementations today are all hardware-based, meaning you need a graphics card with a Teradici chip in it on your remote host, and a thin-client device with a Teradici card in it to connect from the client end. VMware’s implementation of this in View will be all software based (Soft PCoIP) and will not require any additional hardware on either end. This is similar to the iSCSI storage protocol where you can use either software initiators that are built in to ESX or a separate hardware initiator board. While VMware View uses Soft PCoIP it still supports client hardware devices that have PCoIP built in to them for the best possible performance. 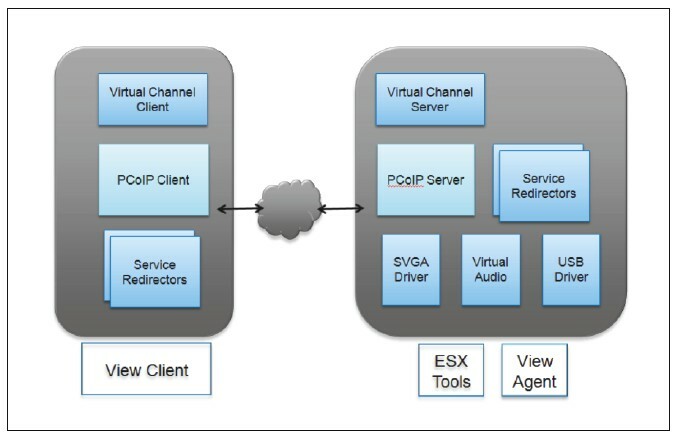 VMware’s software implementation of PCoIP uses Transmission Control Protocol (TCP) and User Datagram Protocol (UDP) over port 50002. The TCP port is used for session establishment and control and the UDP port is used for optimal performance of media and streaming content. All traffic between the host server and remote user is encrypted with 128-bit Advanced Encryption Standard encryption. One of the biggest challenges with remote desktops is dealing with remote users that have low bandwidth and/or high latency network connections; PCoIP handles these types of situations very well and still delivers a decent remote desktop experience to a user. Like the hardware implementation, the software implementation uses components on both the host and remote user end. The host side is built in to the user desktop that resides on the host server using a View agent and the remote side is built into the View client software. Because this is done with software instead of hardware that can offload the additional processing needed to compress the display information you might think this will cause additional resource overhead on your host servers, specifically with CPU usage. VMware has done some initial testing and found the impact to the host was negligible and in fact performance was better allowing them to get more desktops on a host server. This could be because VMware View 4 now runs on vSphere which provides better overall performance than VMware Infrastructure 3 which was used for View 3; VMware is still testing to provide more information on the scalability and performance of PCoIP. You can, however, can use Teradici cards in ESX host servers to offload the extra CPU processing from the host server similar to use hardware initiator cards with the iSCSI storage protocol. For more information on VMware View 4 and PCoIP visit VMware’s website, and check out the VMware View with PCoIP Information Guide. It's an interesting technology to keep an eye on but it's being over-hyped by VMWare - from experience by asking just a few educated questions, their reps/SE's and delivery partners are losing a lot of credibility considering most haven't even seen the technology in action and it appears that none have even read Teradici's FAQ on the subject of hardware vs software PCoIP: "The differences between hardware and software display compression can be characterized by differences in server CPU loading, network loading and user experience (resolution, display frame rates etc.). [B]Software display compression can optimize for any one aspect (CPU, network or user experience) at the expense of the other two[/B]."